Published on the Ms. Magazine blog on March 10, 2015. Site intro: This March, for Women’s History Month, the Ms. Blog is profiling Wonder Women who have made history—and those who are making history right now. Join us each day as we bring you the stories of iconic and soon-to-be-famous feminist change-makers. Patriarchy still rules the roost when it comes to the world’s most popular spiritual faiths. Women are still barred from holding clergy positions in many strains of Christianity, Islam and Judaism, which means they are excluded from the most prominent decision-making roles in organized religion. Yet despite the obstacles women face in achieving full equality with men in the spiritual realm, they have always found a way to maneuver around sexism and get their voices heard. Just how long women have been doing so might surprise you. Anne Hutchinson was one such woman. The daughter of an Anglican clergyman who had butted heads with church authorities, she became a devout Puritan and supporter of John Cotton, following the renegade preacher from England to the Massachusetts Bay Colony in 1634. There, she offered spiritual meetings in her home. Around 60 people attended each week (a significant number for such a small colony), including high-profile men such as colony governor Henry Vane, thanks in part to Hutchinson’s reputation as a respected midwife and her apparently skilled capabilities in biblical discourse. During these sessions, she would promote Cotton’s theology as well as share her own spiritual deliberations. This drew the ire of other Puritan leaders who thought both Cotton and Hutchinson’s beliefs strayed too far from Puritan orthodoxy. For one, Cotton and Hutchinson had advocated that God’s grace was all that was needed to save a person’s soul and that good works were not necessarily required. Both Cotton and Hutchinson were accused of heresy, but Cotton was exonerated and avoided going to trial. Hutchinson, however, did not fare so well. The magistrate John Winthrop, who by then had become the new governor of the colony, was particularly unimpressed with her “very voluble tongue, more bold than a man.” But educated and clever, Hutchinson was able to run circles around her male examiners. Her fiery words earned her banishment from the colony. Hutchinson and her family re-settled in Rhode Island and are considered some of the original founders of the colony. She lived a tragic life from that point on and suffered a miscarriage, which the Puritan leaders in Massachusetts took as evidence of divine retribution. In 1643, Siwanoy warriors killed Hutchinson and nearly her entire family. 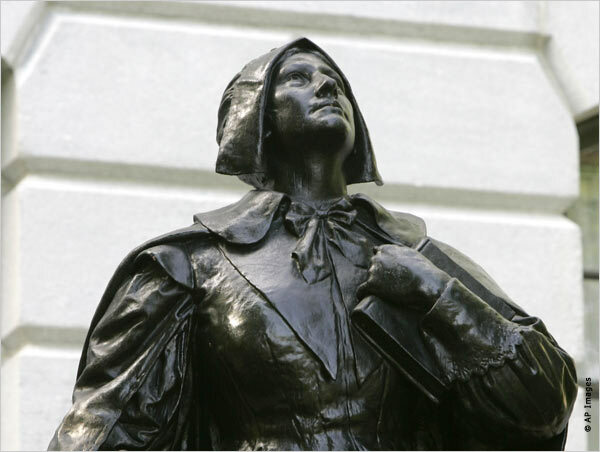 Today, however, the state of Massachusetts honors Hutchinson for having promoted “civil liberty and religious tolerance.” A statue of her stands at the Massachusetts State House in Boston. Image from the U.S. Embassy.